This weekend I wanted to celebrate Memorial Day by digging into some shellfish. 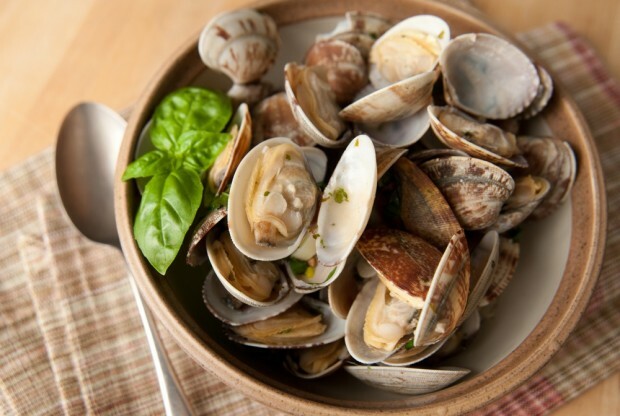 This recipe is a traditional French preparation for shellfish using garlic and onions to flavor the broth. Normally the recipe would also call for white wine, which we are going to replace with water and lemon juice to for the needs of the Dukan Diet. It can also be made in under 10 minutes, which is a great added bonus. 1. Heat a skillet with a cover or Dutch oven over medium heat. Spray with cooking spray and add the onion, garlic, and thyme and cook for 5 minutes. 2. Add the water, lemon juice, salt, pepper, and shellfish. Cover and cook for 6-9 minutes or until shells open up and fish is cooked through.